I always give my dad a basket for Christmas and this year will be no different. 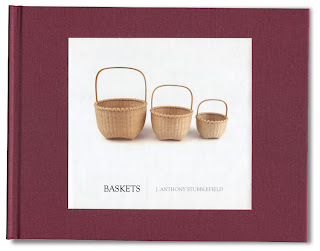 But, this year I am also giving him an iPhoto book I created with images of many of the Shaker baskets (and a couple Nantucket baskets) I have made over the years. It is kind of a catalog of my work I guess. I included a title of each basket along with the dimensions. I think it turned out pretty well. I had two versions made, one that is pictured here is a hardback version and the one I am giving Dad. The other is paperback and has a die cut in the cover to show the baskets which are on the "fly sheet." If you haven't used iPhoto (it is a Mac software title) it is pretty cool to use to set up photo books. There are online versions as well, but I am not sure if you have as much control over the images as you do in iPhoto. Of course I am much pickier than your average human being... This book is about 8.5"x11", but you can make a variety of different sizes and layouts. I may make a few smaller books with just one basket per page, but that will have to wait until after the holidays. Alice Ogden, 2009 Christmas Ornament, 2.75" dia. x 3.5" h.
I just received my Alice Ogden Christmas ornament. This year's basket is as beautiful as always. 2009's is a round lidded feather basket with captured lid. If you aren't familiar with Alice's work you should definitely visit her website. She prepares all of her own brown ash splints and white oak handles and rims. 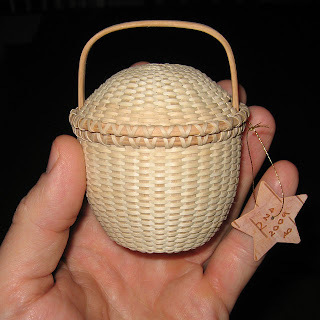 Her baskets are not only beautiful they are also very reasonably priced, especially if you are looking for larger baskets. Besides all of her annual Christmas baskets I have a number of others of hers in my collection, like a nesting set of 7 miniature swing handled baskets and a Shaker cheese basket. Alice always signs and dates her baskets, but this time she added a number to each basket on a little star-shaped tag of birch bark. I was fortunate enough to receive basket #2! 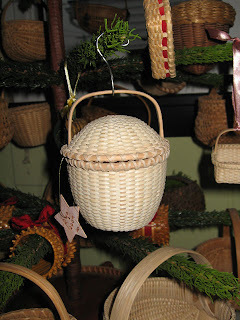 Of course the basket went immediately on my basket tree I keep up all year in my work room. For the last quite a few years I have been making my own greeting cards. I now make them for Valentine's Day, Halloween, Thank Yous, Birthdays and of course Christmas. Some years the designs get quite elaborate and end up taking way longer than I thought they would and I am sure longer than the recipients realize. A couple of years ago I decided to do a basket related Christmas card. The year before I had some custom stamps made at Village Impressions of some of my baskets and they turned out so well I made a few more and decided to do some of a basket full of different items, like pine cones, holly leaves and apples (though I screwed up and didn't get the apples made). 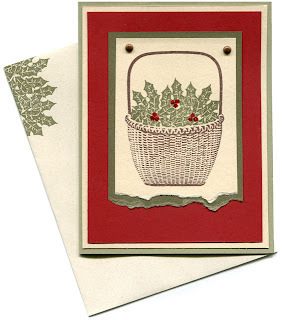 I wasn't sure what the reaction to the relatively simple (and fast to make) cards featuring a basket of holly leaves would be, since most of my friends are non-basket weavers. Well everyone ended up absolutely loving them. Since it has been a few years I need to come up with a new basket design. This year's cards are of a snowman (store bought stamp) and I will have to post about it later. I am about finished making them and definitely need to start getting them addressed! I have been home sick the last couple of days with a sinus infection and since sitting up seems to be the most comfortable position to be in I have gotten a few things accomplished. Since I am such a worry wart I have even gotten some Work work done too. Hopefully by tomorrow I will be back to 100%. I have a feeling that the hysteria of Christmas shopping yet completed is about to strike. I can't afford another day of being stuck in the house.